South Point Hotel has installed a QSC Audio Q-Sys Core 500i network processor, CX Series amplifiers, and AcousticDesign ceiling speakers to handle paging and P.A. in its recently expanded Arena and Equestrian Center. The South Point Hotel is a Casino and Spa in Las Vegas. It was the first mega-resort to be built south of McCarran Airport on the Las Vegas Strip. The resort, which purchased the QSC Audio components through Solotech Las Vegas, intends to extend the Q-Sys network into a $30 million bowling arena planned for completion at the beginning of 2016. The property opened at the very end of 2006, and added QSC Audio BASIS networked audio products to the resort. South Point recently expanded a concourse and added meeting rooms to its Arena and Equestrian Center. It features a 4,600-seat show arena, an indoor practice arena, and a covered outside arena. The center also hosts motor sports and other events in addition to equestrian shows. Lein and his crew installed a dozen AcousticDesign AD-CI52ST two-way, high fidelity in-ceiling speakers in the concourse and meeting rooms, as well as TSC-3 networked touch screen controllers in the meeting rooms. South Point added QSC CX602 amplifiers to power the new ceiling speakers. Production staff members employ wireless control of the Q-Sys set-up. At the end of April, South Point, Las Vegas Events, and the Las Vegas Convention and Visitors Authority jointly announced a 12-year agreement with the United States Bowling Congress to host seven championship events in Las Vegas beginning in 2016. South Point, which already features a 64-lane Bowling Center, home to the Professional Bowlers Association's World Series of Bowling, will build a two-story complex housing a 60-lane bowling facility outfitted with the latest technology on the top floor and two additional horse arenas, sound isolated from the floor above, on the lower level. 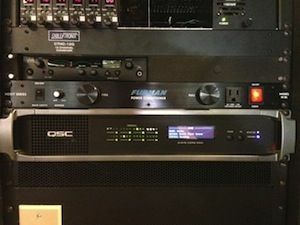 The upgrade to the Q-Sys system’s advanced Layer 3 networking technology has made it easier for Lein to program the new set-up.